AMAZONAS March/April 2014 Cover Preview. Click to enlarge. 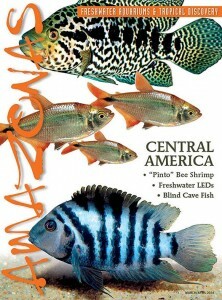 The home range of many tropical fish favorites—exotic cichlids, brilliant tetras, rare killifishes, and an amazing array of livebearers— the streams, cenotes, and forest pools of Central America from southern Mexico and northern Guatemala through Panama is rich in both cultural history and biological diversity. 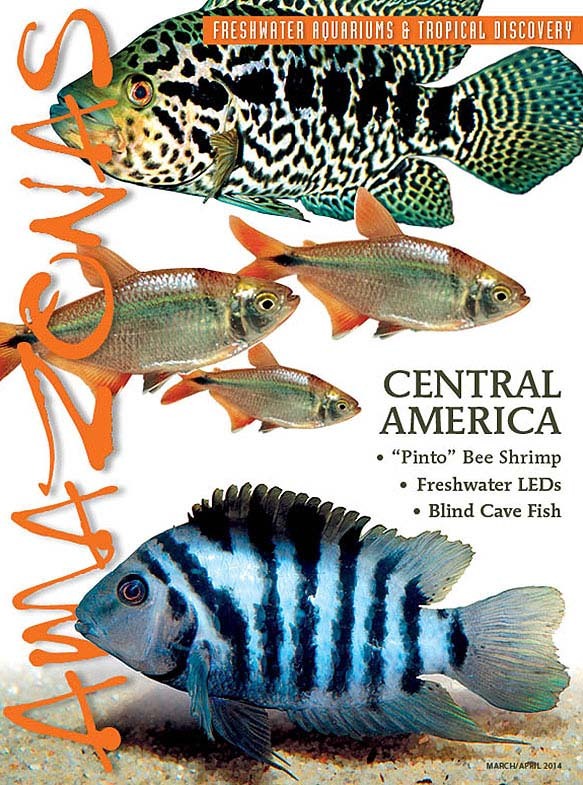 Look to the next issue of AMAZONAS for an exploration of the waters of “Middle America” and a portfolio of exceptional and new species for the freshwater aquarium enthusiast. Includes Sascha Thamm’s overview of the fish fauna of Central America, an exploration of the amazing sinkholes of the region by Kai Qvist and Rune Evjeberg, in-depth look at the astonishing Curve-bar Cichlid, Herichtys labridens by Juan Miguel Artigas Azas, and introductions to the native Mexican Shortfin Molly and the new dwarf cichlid, Apistogramma atahualpa. • Seeing the (LED) Light: Kris Weinhold surveys the growing selection of new lighting choices for home aquariums, and offers the freshwater aquarist a guide to selecting appropriate lighting for systems of all sizes. First of an Amazonas Magazine Series. • Blind Cave Fishes: An eye-opening survey of the many types of sightless aquatic animals that have evolved in the world’s tropics. • Riparium in the Mists: Devin Biggs offers a portrait of an astonishing riparium system created by Don Boyer with both above-water and below-the-surface tropical biotopes. • “Pinto” Multistripe Shrimp: The explosion of new and ever-more-colorful Bee Shrimp continues, as a team of Amazonas photographers and writers documents in a must-have section for all freshwater invertebrate lovers. You just made my day. Anxiously awaiting this issue. The Ufermanni was the perfect choice!